Congratulations to Cate Lane, our December Volunteer of the Month! Cate has been volunteering at Interfaith since Sept. 2013. She works at the front desk on Tuesday mornings and runs the cash register on Monday afternoons in the Bureau Drawer Thrift Shop. She was nominated for Volunteer of the Month by her Tuesday front desk co-worker, Ellen Walsh. Ellen Walsh, left, and Cate Lane, right, Interfaith’s Tuesday morning front desk volunteers. “Cate has volunteered for several years at Interfaith, with a smile for everyone. She covers the front desk where she is always empathetic and kind to all clients. She goes out of her way when a client is in particular need. For example, she once worked with Charlene to help a new immigrant find a sewing machine so that she could continue to be a tailor here in the U.S.
1. Why did you choose to volunteer at Interfaith? 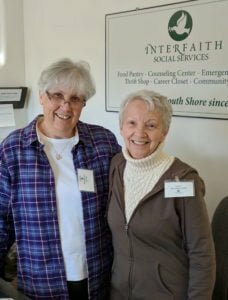 I chose to volunteer at Interfaith after researching nonprofit organizations in our community. I wanted somewhere fairly close so I could still get there in bad weather. When I looked into Interfaith, which is practically around the corner from where I live, I realized this was the same organization that started as the Protestant Social Service Bureau & had been located (again) right around the corner from where I lived in Wollaston. Although I was not that familiar with it at that time, I had known it was a respected organization which did a lot of good for the community. So it was a matter of convenience for myself, respect for the organization & appreciation of the work done by Interfaith. 2. Is there a certain aspect of our mission that motivates you to want to volunteer here? The fact that Interfaith treats all clients with compassion & dignity is a definite motivation for me. And, the Food Pantry (incredible!) and the Counseling Center help fill a definite need in the community. 3. What other volunteer experience have you had? I previously volunteered at Quincy Medical Center (2010-2014) and many, many years ago at Carney Hospital. 4. What do you enjoy most about volunteering here? I enjoy working with the other volunteers who are always upbeat & go out of their way to treat everyone with respect & kindness. Mostly, I enjoy working for the clients and honestly feel I benefit as much as the clients by volunteering here. When a client is leaving the office & turns to say thank you or God bless you, you know you are truly blessed and fortunate to be a part of the Interfaith organization. 5. Tell us something interesting about yourself that the other staff and volunteers may not know. I have become a genealogy fanatic recently & have corresponded with new found relatives in Ireland, England & Liechtenstein. While researching, have also discovered my son is eligible for membership in the Sons of American Revolution & the Mayflower Society (on his father’s side of course).